Well, while I am very happy to have seen Ryuichi Sakamoto at The Vic last night, I don’t think Sakamoto fans missed much if you did not go (you can see many pieces on Sakamoto’s YouTube Channel and elsewhere on YouTube). He started late, played about one hour, which ended with “Merry Christmas, Mr. Lawrence,” and then he did three songs as encore, all from the “olden days”: “Tibetan Dance” from Ongakuzukan, “Happy End” from BGM, and “Thousand Knives.” I had read some reviews, and the set list was exactly the same as everywhere else. There’s no denying the genius of his musicality and virtuosity, both of which are classically trained and delicately poetic. The volume was too low for my liking, especially when his piano had to compete with the occasional Excel XLERATOR hand dryer in the bathrooms in the back of the theater and down one level. At first I thought someone was running a vacuum or something in the bar areas and then realized after the show when I went to the bathroom the sound was coming from the hand dryers. Totally annoying. Three-to-four people went to the bathroom during the show and used the hand dryers. It’s not their fault. I fault The Vic. They need to rip those outta there and put in paper and deal with the cost and clean up. For these quieter, artsy performances the hand dryers are a total buzz kill. And then there were the few people coming and/or going from the theater and letting the doors bounce closed. Argh! There weren’t many people there, and there were only general admission seats, i.e. folding chairs on the main floor. The balcony was closed. The cool thing about his performance was the set up of two Yamaha grand pianos. Most of the pieces were just him playing the grand with periodic, deeply low-pitched, rumbling, pink noise-ish, wave-like sound effects, barely audible, that served as atmospheric connective tissue among all of the pieces. He was also accompanied by minimalist, abstract video run from an iMac. 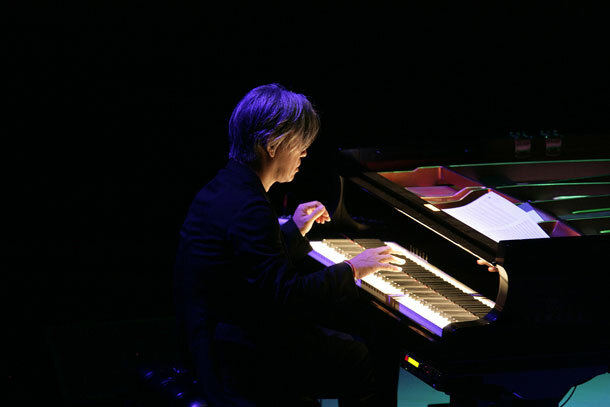 There were two pieces, IIRC, that he played as a “duet” with the other grand controlled by a digital Disklavier, which played Sakamoto’s pre-recorded performance including all of his nuanced pedaling and key pressure, i.e. the other grand was a very sophisticated player piano. In a very real sense he played duets with himself. All three encore pieces were duets using this method.